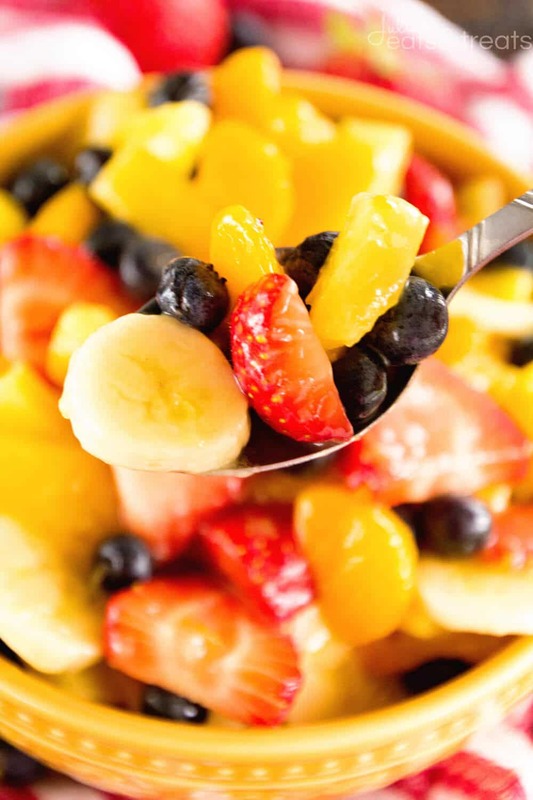 Sunshine Fruit Salad ~ Delicious, Easy Fruit Salad Recipe filled with Strawberries, Pineapples, Bananas, Blueberries and Mandarin Oranges! 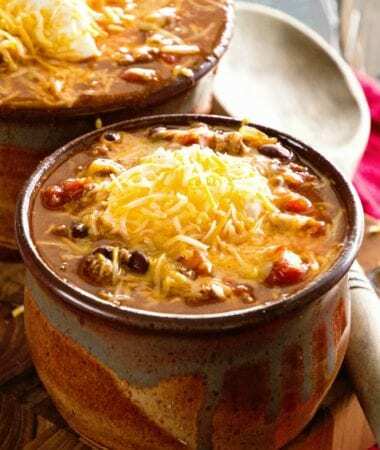 Perfect as a Side Dish or for Brunch! Mmmmm popcorn! If there is one thing in life I’m addicted to I think it’d be popcorn…not chocolate, not alcohol, just popcorn. At least it’s something in life that can harm me tooo much! I’m winding down the night with some popcorn while holding down the couch with my wonderful hubby…each of us on a different laptop. Impressive huh? I mean they used to say you were married a long time when you both read the newspaper or something. Well it looks like in these new times it’s when you both have a laptop! Busy busy day today…I worked until 4 then I came home and went crazy in the kitchen for Easter tomorrow. I made this salad recipe I’m going to share with you, a vegetable casserole (recipe to come later) and got some of the stuff for my lettuce salad ready also. Jason was awesome and grilled burgers and made potatoes on the grill tonight so I didn’t have to worry about that. I absolutely love summer because it means that Jason becomes Mr. Grill Master and it gets me out of cooking supper a lot! After supper we got ready and went bowling at the Evinks. Jason took the first game and left me in the dust but I’m proud to report I came from behind and over took him the last frame of the second game to beat him! Tomorrow’s activities have us going to church, off to my Aunt Pam’s and then to supper at my Aunt Cheryl’s. The recipe I’m going to share with you tonight is what I made for brunch at church tomorrow. It’s my amazing mother’s recipe once again. I called her up to ask her what she thought of a few recipes and she came to the rescue with her own. She even whipped up a batch last week so I could taste test it before I made it. I mean how can you beat that? Well, she could have made it all for me but that didn’t happen 🙂 Happy Easter everyone! First drain pineapple and oranges, reserving liquid. Prepare the pudding with 1 c. of the reserved liquid, whisking until mixture is smooth. 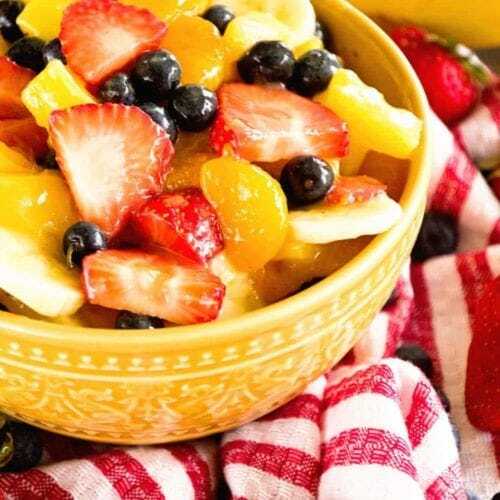 In a large bowl combine pineapple, strawberries and oranges. Gently fold in pudding mixture. Refrigerate until ready to serve. Add bananas and blueberries to mixture right before serving. You Might Enjoy these Salads! 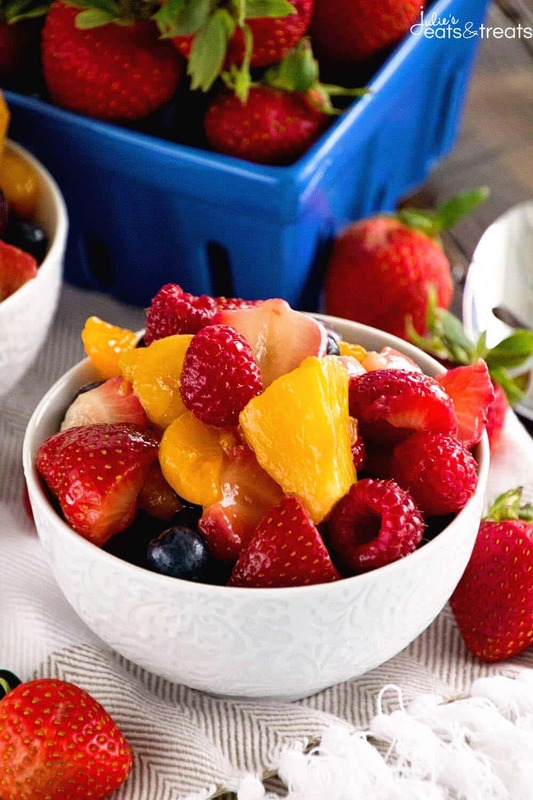 Easy Fruit Salad ~ Simple and Delicious Fresh Fruit Salad Recipe Using Vanilla Pudding Mix! 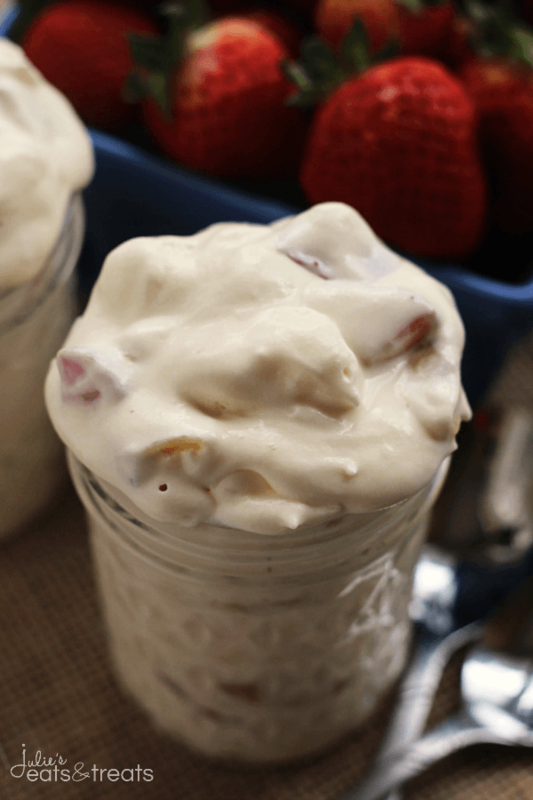 Strawberry Tapioca Salad ~ Fluffy Salad Loaded with Tapioca & Strawberries! It is freezing cold over here, but I would devour bowl after bowl of this sunshine salad! Makes me happy just looking at it! Hope you have a wonderful Easter! Cheers! one of my favorite dessert.. thanks for sharing a variety ingredients..